It’s not too soon to start making plans for the 16th annual GIS Day, an international celebration of GIS technology and its ability to make a difference in our society. Last year, more than 1,000 hosts registered GIS Day events, with more than 105,000 people attending celebrations in 98 countries worldwide—one of the biggest GIS Days ever. GIS Day 2014—officially to be held November 19—traditionally takes place each year during the National Geographic Society-sponsored Geography Awareness Week. Each year, GIS users invite guests to GIS workshops, tour map galleries, watch hands-on GIS technology demonstrations, learn about educational and career opportunities, hold rallies, and much more. If you’re interested in hosting an event, visit the GIS Day website to register. You’ll find plenty of free resources to help you put together a fun and successful celebration—logos, flyers, posters, postcards, PowerPoint presentations, web templates, desktop backgrounds, certificates of participation—plus giveaway items, including coloring pencils, magnets, and water bottles. 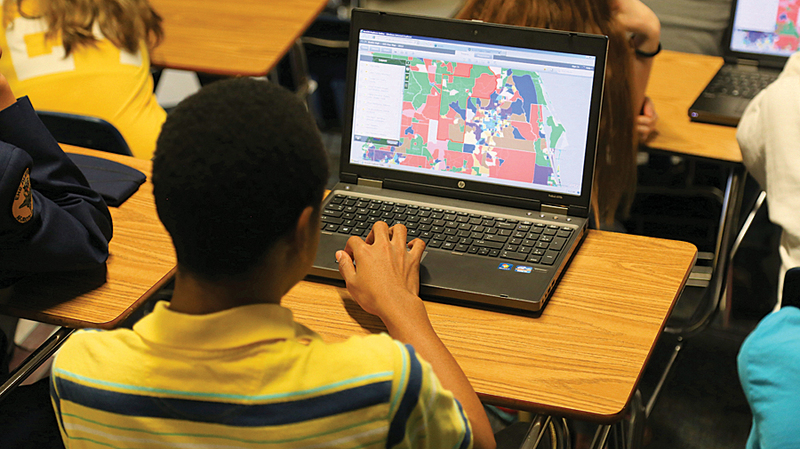 In addition, there are free sets of age-appropriate activities to use during your GIS Day festivities, such as historical maps, geocaching, and e-books. GIS Day was held at the Faculty of Logistics and Crisis Management in the city of Uherské Hradišt, a part of Tomas Bata University in nearby Zlin, Czech Republic. The event was hosted in partnership with Uherské Hradišt and the city’s Students Association, according to Dr. Jakub Trojan, deputy of the faculty’s Department of Environmental Security. Lecturers came from the university, the city, and environmental nongovernmental organizations. “The morning focused on workshops and seminars for secondary school pupils, aged 17–19. About 160 students and their teachers were on hand. The afternoon was devoted to lectures for the public and regional government,” he says. Trojan says that special GIS Day activities included a large, high-resolution orthophoto of Uherské Hradišt by day, prepared by the city to display its new concept of spatial planning. A night scene allowed GIS Day participants to use their awareness of places in the city and create a mental perception map. Blue Raster, an Arlington, Virginia-based custom web applications developer and Esri Partner, celebrated GIS Day by inviting GIS students from Washington-Lee High School to spend the day. For the second year, Blue Raster has hosted the class, giving students insight into how GIS professionals are making a positive impact on the world and enriching people’s lives. Blue Raster developers invited the students to use Instagram to connect to other GIS Day celebrants around the world and created a GIS Day global map. Students immediately saw the future prospects of geospatial technology. The Blue Raster development team shared real-world GIS success stories with a round of Lightning Talks about ongoing projects and then challenged the students’ analytical skills with a geography challenge, says teacher Ryan Miller. “We wrapped up with a talk about GIS careers and enjoyed some pizza and prizes. A great GIS Day,” says Miller. Lake County, Florida, organized several government departments, including GIS, Water Authority, Public Safety, and School Authority, to put on a GIS Day event for high, middle, and elementary schools in the county. “We feel that GIS Day is an excellent demonstration of how GIS users can get together and try to teach the next generation about the potential of GIS and cloud technology,” says Brandon Barnett, GIS analyst at the Lake County Office of Information Technology. Assisted by eight volunteers and armed with an assortment of knowledge ranging from how GIS is used in public safety to its use in maintaining tax data, the team showed students the variety of disciplines into which GIS can be integrated. “We tried to specifically focus on ArcGIS Online, how students can create accounts for free, and how they can use these accounts to better document their life and their world,” Barnett says. The Centre de géomatique du Québec (CGQ), based in Chicoutimi, celebrated its 15th anniversary November 20, 2013, by hosting a GIS Day event at the Cegep de Chicoutimi, a French-language general and professional educational college. Sixty-eight people from universities, colleges, industries, and the general public attended to celebrate the company’s evolution as a nonprofit organization. Its mission is to promote wider use of geomatics, also known as geoinformatics, in Québec’s business world, says event organizer Karine Jean, a geomatic analyst with CGQ. Geomatics involves the science and technology of gathering, analyzing, interpreting, distributing, and using geographic information. The field encompasses a wide range of disciplines, including surveying and mapping, remote sensing, GIS, and GPS. “This was our fourth edition of GIS Day, and the most popular one of all,” Jean says. According to Jean, company staff were with participants at the college in the afternoon to discuss geomatic equipment and the kinds of projects it is possible to achieve. After 5:00 p.m., the public was invited for an evening of information and networking. On display were pieces of geomatic equipment dating from the 1940s through today. “It was very interesting to see the evolution of this equipment over time,” Jean says. “The civil engineering and forestry departments of the Cegep de Chicoutimi lent us some total stations used in surveying.” Patrice Fradette, a former geomatic analyst at CGQ, and André Goderre, an informatics analyst at CGQ, spoke on the evolution of real-time monitoring over the past 15 years. The GIS Day event also included some project posters about research CGQ had conducted in recent years.